It has begun; YWAM Yosemite's Fall DTS is here and we could not be more excited to see the transformation of our minds during this time. Diving in and hitting the ground running, we prepared for His kingdom to show up at YWAM Yosemite but what we weren’t ready for was the blessing of all the donations for our base. God gave us tables, chairs, desks, couches, projectors, white boards, world maps, full commercial kitchen supplies, etc. The list goes on and on. We fall on our faces in awe of His goodness, realizing that we aren’t our own providers but He is the one in control and provides. Week one of DTS lecture has been like a giant wave of God's grace coming over the students. God has brought us some amazing students who are ready to give it all for the sake of the kingdom. The first night, we opened with worship and the students were sold out on their knees, laying their hearts on the floor before God. I don’t know about anyone else but I think that is the way we should all enter into Discipleship Training School. 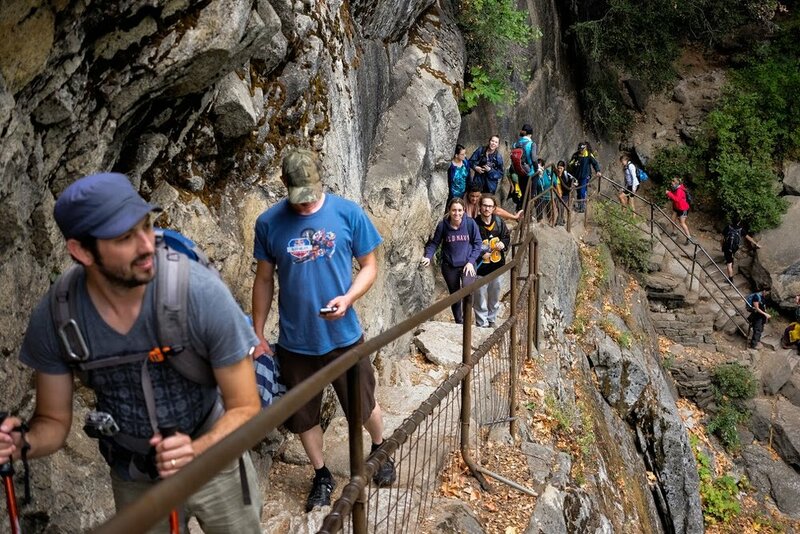 After spending three days getting familiar with each other, reading the syllabus, and discussing outreaches, we had the opportunity to take the students to go hiking in Yosemite National Park. The hike provided a time where we got to know each other through exploring God's creation, pushing through physical barriers, and team building. The first week of lecture started off with "Recognizing the Voice of God" taught by Joy Nielsen. It was amazing to see new revelations come to the students and, for some, hearing God's voice for the first time! These students are holding nothing back and are on fire for Him. They're representing a generation that is so hungry to know God as Abba Father and they want to make Him known to a lost and broken world. One of the phrases we've been using here a lot is "because we're pioneering" (look up the hash tag #becausewerepioneering) It's an appropriate phrase because when the students arrived their housing was not yet available so some had to live temporarily off-campus while others lived eight to a small room. After a long wait of six days, we were finally able to move into our student/staff housing and take ownership of the place God has called us to and we are so blessed to be here. The DTS students and staff are already getting really close to one another: having deep conversation, crying with one another, laughing out loud. We are so blessed to kick off the first ever DTS at YWAM Yosemite with a powerful bang and see these students enter in the fullness of their identity in Christ!